TO INSURE the return of empty milk bottles and eliminate the cost of replacements, an automat has been devised which dispenses candy and gum in exchange for “empties.” Shaped and painted like a huge milk bottle, the container has a capacity of 60 bottles. The empty bottle is placed on a red hook in an opening near the top and a handle is pushed to the right to deposit the bottle. 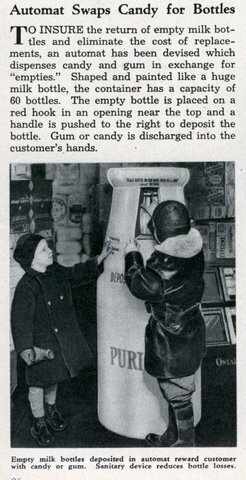 Gum or candy is discharged into the customer’s hands.